The American northwest is one of the most beautiful places in the world, with deep forests, waterfalls, volcanoes, and craters. Oregon is a dream to anyone who loves the outdoors. The cities in Oregon are rich in culture and attract creatives from all over. The tech industry is huge here as well, with Intel headquartered here. One of the other largest companies in the state is Nike, with an expansive campus that nearby residents often jogging through its beautiful grounds. With all the creative energy in the state, it's no surprise that it has some very safe cities. 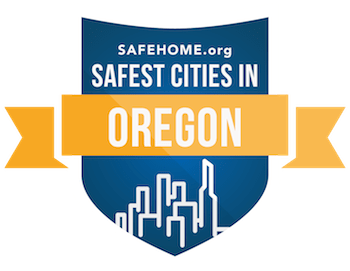 On the national level, Oregon is home to 3 of the 500 safest cities in the nation. The 25 safest cities range in safety scores from a high of 84.81 to a low of 54.5. The majority of the cities have a safety rating above 70. Most of the cities have not seen any increases in their crime rates, with a few experiencing declines. Pendleton is the safest city in the state according to our rankings. It has a population of 16,969 with a safety score of 84.81. It is located near the border with Washington state, far inland. Residents here take pride in their town and way of life, with several annual events. They have a rodeo every year as well as a fundraising event for the St. Anthony Hospital. This helps create a tight community, and lowers crime rates. Most of the cities are along the coastline, where there is much more traffic between California and Washington. Eugene is one such city, with a safety rating of 69.39. Some of the other cities are Salem (68.29), Albany (74.88), and Salem (68.29). There are others further inland and by the mountains like Bend (76.17) and Ashland (74.93).